After all, the large bonuses paid to banks’ CEOs as they led their firms to ruin and the economy to the brink of collapse are hard to reconcile with the belief that individuals’ pay has anything to do with their social contributions. Of course, historically, the oppression of large groups – slaves, women, and minorities of various types – are obvious instances where inequalities are the result of power relationships, not marginal returns. In today’s economy, many sectors – telecoms, cable TV, digital branches from social media to Internet search, health insurance, pharmaceuticals, agro-business, and many more – cannot be understood through the lens of competition. In these sectors, what competition exists is oligopolistic, not the “pure” competition depicted in textbooks. A few sectors can be defined as “price taking”; firms are so small that they have no effect on market price. Agriculture is the clearest example, but government intervention in the sector is massive, and prices are not set primarily by market forces. US President Barack Obama’s Council of Economic Advisers, led by Jason Furman, has attempted to tally the extent of the increase in market concentration and some of its implications. In most industries, according to the CEA, standard metrics show large – and in some cases, dramatic – increases in market concentration. The top ten banks’ share of the deposit market, for example, increased from about 20% to 50% in just 30 years, from 1980 to 2010. Some of the increase in market power is the result of changes in technology and economic structure: consider network economies and the growth of locally provided service-sector industries. Some is because firms – Microsoft and drug companies are good examples – have learned better how to erect and maintain entry barriers, often assisted by conservative political forces that justify lax anti-trust enforcement and the failure to limit market power on the grounds that markets are “naturally” competitive. And some of it reflects the naked abuse and leveraging of market power through the political process: Large banks, for example, lobbied the US Congress to amend or repeal legislation separating commercial banking from other areas of finance. Joseph Schumpeter, one of the great economists of the twentieth century, argued that one shouldn’t be worried by monopoly power: monopolies would only be temporary. There would be fierce competition for the market and this would replace competition in the market and ensure that prices remained competitive. My own theoretical work long ago showed the flaws in Schumpeter’s analysis, and now empirical results provide strong confirmation. Today’s markets are characterized by the persistence of high monopoly profits. The implications of this are profound. Many of the assumptions about market economies are based on acceptance of the competitive model, with marginal returns commensurate with social contributions. This view has led to hesitancy about official intervention: If markets are fundamentally efficient and fair, there is little that even the best of governments could do to improve matters. But if markets are based on exploitation, the rationale for laissez-faire disappears. Indeed, in that case, the battle against entrenched power is not only a battle for democracy; it is also a battle for efficiency and shared prosperity. FROM THE AIR, the red sand dunes of the Empty Quarter stretch out beyond the bend of the earth, like countless piles of powdered brick. Between the mounds the winds have exposed patches of grey: salt flats that encrust the rock, and great riches of oil. The Empty Quarter was once the passage for camel caravans carrying precious frankincense across the southern Arabian peninsula. These days Saudi Aramco, the giant state-owned oil company, has laid roads and pipelines in the wilderness to carry the much-prized Arabian extra light crude and gas to the refineries and export terminals hundreds of kilometres further north. Shaybah, a small town of 1,500 people, emerges from the sand. Those who work there say the winds never move the dunes, yet they quickly cover anything that has cut through them, such as the airstrip, which must be cleared regularly. Everything, including sand for construction (the local stuff being too fine), had to be brought by long convoys of lorries. Drilling through the dunes is impossible, so oil wells start from the patches of salt flats and then push out horizontally to get at the oil. Aramco is one part of the Saudi state that works impressively well. In fact, it is more of a state within a state, with its own schools and air services. Aramco’s executives dismiss the idea that the slump in oil prices, from a peak of about $115 a barrel in 2014 to little more than $45, spells doom for Saudi Arabia’s oil economy. Shaybah was developed when oil was at $15 a barrel, and its fields would still be profitable at $10 a barrel, Aramco claims. The company continues to drill exploration wells to keep up its proven reserves and is investing both upstream and downstream. Producers of more expensive oil, including some from shale in America, will be driven out of business long before before Aramco is in trouble, its managers say; as global production falls and demand recovers, the price is bound to rise again. Abundant and easily accessible, oil has been the basis of the Gulf’s rentier model of the state: the ruling family collects the rent from oil and distributes the proceeds generously, in the form of public goods, welfare and subsidies, in return for compliance from the population. This model applies across much of the Arab world. 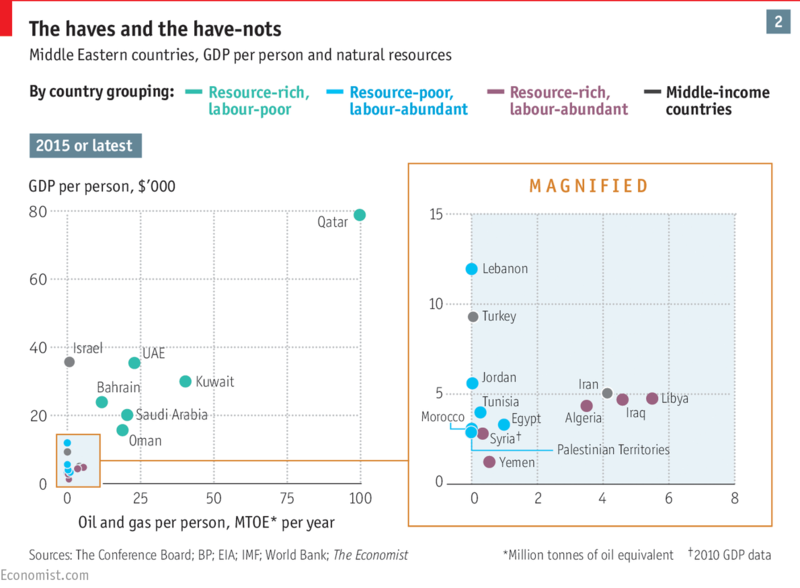 Its economies can be divided into three broad categories: resource-rich, labour-poor Gulf sheikhdoms with lots of oil and gas but few people; resource-rich, labour-abundant states, such as Algeria and Iraq, that have natural resources and larger populations; and resource-poor, labour-abundant countries, notably Egypt, that have little or no oil and gas but lots of mouths to feed (see charts). It was once thought that the middle group, with the resources and manpower to industrialise, would do best; in fact it has done as badly as the oil-poor grouping. And those middling states tend to be more nakedly authoritarian: they may not have enough oil to buy the quiescence of their people, but plenty to pay for the machinery of repression. To a degree the whole Arab world is an oil-driven economy: all three groups tend to rise and fall with the price of oil. 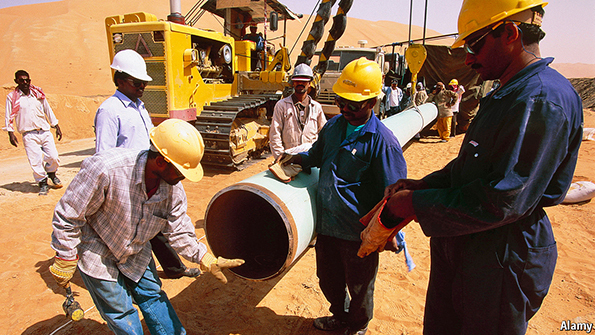 Millions of Arabs from resource-poor countries are guest workers in oil-producing states. Conversely, high-spending Gulfies like to holiday in places like Cairo and Beirut. Grants and loans from Gulf states help sustain poorer Arab countries. Some countries, such as Egypt and Jordan, also enjoy “strategic rents”: subsidies provided by Gulf states and the West because their stability is deemed essential to regional order. Egypt, for instance, has been heavily supported by Saudi Arabia and the United Arab Emirates since the coup in 2013. Saudis may not be the richest people in the Gulf, but their country remains the world’s largest exporter of oil. And for all of Aramco’s bullish talk about the prospects for oil, there is anxiety about the future. The regional contest with Iran is keeping output high and oil prices low. Saudi Arabia says it will curtail production only if Iran does; Iran insists it has every right to return to pre-sanctions levels of output. The inconclusive war in Yemen, and support for governments and Sunni groups elsewhere, do not come cheap. What goes for Saudi Arabia applies, to a greater or lesser extent, to all members of the Gulf Co-operation Council. Qatar, the wealthiest of them, is likely to be least affected; Bahrain and Oman, with less oil, will be in deeper trouble. Plans to start taxing Gulf citizens are in the pipeline, starting with a 5% value-added tax in 2018. Saudi Arabia and other Gulf states will have to do what they have long promised but for the most part failed to achieve: diversify away from oil. Not every country can become a tourism and services centre like Dubai. Prince Muhammad bin Salman, the Saudi ruler’s 30-year-old son and the power behind the throne, has spoken most ambitiously about the change he wants to bring about through his “Vision 2030”, a plan to wean his country off oil by that date, if not sooner. To listen to Saudi ministers, their answer to the ineffectiveness of the Arab state is to sidestep it as much as possible. Prince Muhammad intends to make wholesale use of the private sector, even to provide basic services such as education and health care, and wants to sell stakes in state assets including Aramco, the crown jewel and probably the biggest company in the world. The government talks of selling valuable land to developers, mining other sorts of minerals, creating a defence industry and greatly expanding tourism—but for pious Muslims, not the Western sort. All this is likely to bring wrenching social change for which Saudi society may not be prepared. A generation of men that expected to be paid for do-nothing government jobs will have to learn to work. The talents of women, who already make up the majority of new university graduates, will have to be harnessed better. But for now even the limited reforms to give women more opportunities have gone into reverse. To achieve its goals, Saudi Arabia will have to promote transparency and international norms, which will mean overcoming resistance from the powerful religious establishment and the sprawling royal family. But perhaps the biggest problem looming for Saudi Arabia is the need to find jobs for a rapidly rising population. 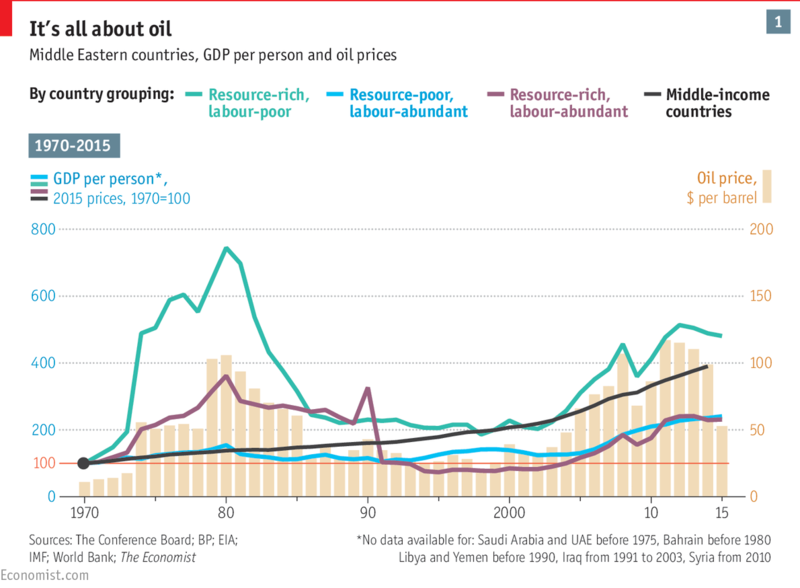 Real output per person in the Gulf is lower today than it was in the 1970s (partly because of migration). Well over half of Saudis are 30 or younger. Public-sector jobs are a form of unemployment benefit that was unsustainable even when oil prices were high. This is a common problem across the Arab world. An abundance of young workers should prove a boon, but in many Arab countries the peak of the youth bulge in the 1990s coincided with a long period of stagnant output, high debt and painful economic adjustment. Import-substitution models under which countries sought to promote domestic production behind protectionist barriers survived longer in the Arab world than elsewhere because oil and other rents masked the inefficiencies of its economies. Where Arab countries belatedly started to promote non-oil exports, they found that more competitive Asian countries had got there first. Still, the macroeconomic numbers gave few hints of the looming political explosion in 2011. In the preceding years growth had picked up, unemployment was stable (though high) and inequality seemed manageable. The crisis seems to have been precipitated by two factors. First, the economic adjustment brought cutbacks in public-sector jobs and services; and second, part-liberalisation appeared to favour only the well-connected. This fed resentment of corruption. Of the three slogans of Egypt’s revolution—“bread, freedom, social justice”—two had an economic component. The turmoil of the five years since the Arab uprisings has dealt a blow to all the non-oil Arab economies, even if lower oil prices have provided some slight compensation. HSBC estimates that collectively they have lost about 15% of potential GDP. Egypt’s budget deficit has widened to more than 10% of GDP. 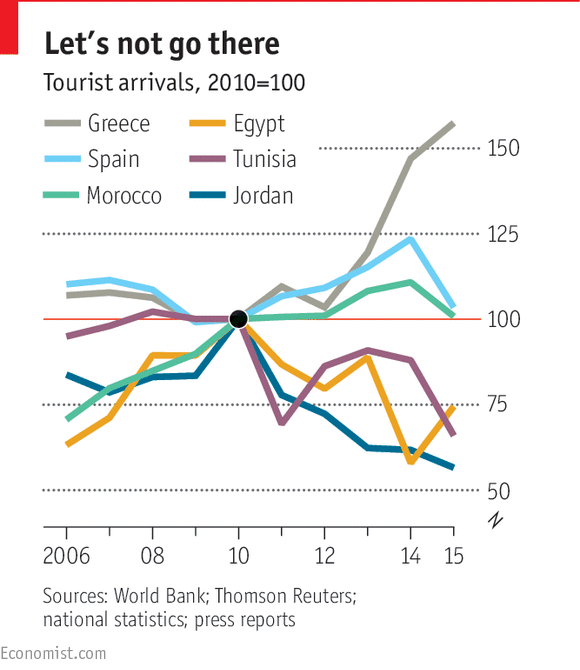 Manufacturing has stagnated and tourism has suffered (see chart). Part of the crisis stems from the country’s self-inflicted shortage of dollars, induced by the government’s reluctance to allow the currency to fall to its market value. In a bid to keep down domestic prices for staples—Egypt imports much of its food—the central bank is, in effect, rationing the supply of dollars. This is at the expense of manufacturing industry, which cannot import the components it needs and finds its exports priced out by the high exchange rate. For all of Egypt’s considerable advantages—comparatively early industrialisation in the 19th century, extensive irrigated agriculture thanks to the waters of the Nile, good transport provided by the Suez Canal, a large internal market and proximity to European ones—the country has been unable to seize the opportunity of globalisation. “We are still trapped in the time of Gamal Abdel Nasser, with state-led development and state-dependent workers,” says Mr Adly. An instructive example is Egypt’s troubled cotton industry, once the country’s “white gold”. Premium-quality long-staple Egyptian cotton was brought to European markets in the early 19th century by a Frenchman, Louis Alexis Jumel, who gave his name to luxury cotton. Production of Egyptian cotton for British and French mills increased rapidly, boosted by the interruption of cotton trade with America during the civil war of 1861-65. Under Nasser the industry was nationalised. Egypt tried to boost industrialisation by building a vast state-owned mill at Mahalla, in the Nile delta. The production of cotton was favoured over domestic food crops, and farmers had to sell below international market prices. The premium varieties were exported for foreign currency, and the lower-quality medium- and short-staple cotton was used to make cheap clothes for local consumption. But as international textiles markets opened up, the inefficient Egyptian mills began to lose money. Growing labour unrest at the mills, culminating in a deadly riot in 2008, was an important precursor to the Tahrir Square demonstrations in 2011. In Morocco, by contrast, the mood is hopeful. A smaller country than Egypt, and far from the upheavals to the east, it has been more successful than most other Arab states at holding on to its all-important tourist industry. It is building up its manufacturing sector by seeking to link into the European supply chain, doing for French industry, in particular, what eastern Europe has done for German companies. Renault-Nissan and PSA Peugeot Citroën have built new car-assembly plants in Morocco, and plans are in hand to develop a wider network of local suppliers. Even more ambitiously, Morocco is working to build an aircraft industry, based outside Casablanca’s international airport. Emerging from the embryo of Royal Air Maroc’s engine-maintenance business, an early step was the manufacture of high-specification electrical wiring for aircraft. On the factory floor of Matis Aerospace, red-veiled women are hunched over the cables—Boeing on one side of the main aisle, Airbus on the other. Nearby a subsidiary of Safran, a French technology group, is making carbon-fibre casings for jet engines. Bombardier, a Canadian aircraft-maker, is setting up shop to make parts for its airframes. The government is part-funding a vocational training school for the aeronautical industry. Hamid Benbrahim el-Andaloussi, the president of GIMAS, the aerospace industry’s trade body, says Moroccan factories can make components 30% more cheaply than European or American ones without any loss of quality. At present the industry consists of about 100 companies with 11,500 employees and $1 billion-worth of exports; by 2020, he predicts, it will more than double in size. Morocco still has far to go. Much of its agriculture, which employs about 40% of the workforce, is rain-fed, and a drought this season has knocked back growth from 4.5% in 2015 to a forecast 2% or less this year. Foreign investors must contend with entrenched incumbents, including the royal family’s large holdings through firms that go by such names as Ergis and Siger (anagrams of “Regis”, Latin for “of the king”). Even so, Morocco shows a dynamism that is sorely needed across the Arab región. The problem is, if you're a wicked money printing central bank, busy debasing our entire society, you can't stop the music because everybody would lose purpose quickly - with all falling down - like Humpty Dumpty. Nope - there's no rest for the wicked - our wicked central planners - because you can't taper a Ponzi scheme. This self-evident truth was confirmed this past week when the Bank of Japan (BOJ) disappointed stimulus junkies and didn't ease, sending the Nikkei down 600 points in just a few minutes. And this is especially true, which central authorities and price managers are finding out on this side of the world as well, with gold and silver becoming increasingly difficult to manage as the markets attempt to discount future dislocations. And precious metals were strong right into month-end, implying the hedge funds 'just gotta hav'em'. (i.e. for month end window dressing.) And in examining key precious metal sector specific open interest put / call ratios (see here) Friday, it appears the 'wall of worry' is still very alive, so there's no telling what's coming in the near-term. Do we get a 'healthy pullback' in spite of this, or do prices keep powering higher, spurred off the wicked ways of central planners? Common sense would dictate caution at this point, however the powers that be generally exercise little restraint these days, which is especially true for the Fed given their predicament. (i.e. will Trump audit them?) So on this basis; so far, fortune continues to favor the bold. The question of the hour now is, 'was that the high on Friday, in April'? Because we don't want the high in May from historical / Fibonacci count perspectives, as discussed previously, however given this thing is so out of control, who knows, maybe precious metal shares go up every month all year - a Fibonacci 13-months. Nobody with an ounce of common sense would ever expect such a thing, however the important thing to realize here is as long as sentiment remains cautious (negative), as is the case right now, anything is possible because guess what - machines have no emotion. They will simply read the headlines and then squeeze the shorts - that's what they do - with no measure for value, overbought - no such considerations. Because the whole move down in precious metal stocks was overdone - but possible in a deep (larger degree) wave 2 - so who is to say they don't rebound as quickly as they fell. It all depends on the dollar($), and we know from last week that the Fedsters are scared of losing their jobs to The Donald, so with earnings crashing they have no choice but to let it fall if they don't want stocks to crash. The $ finished on the lows last week, and what could be classified as 'last ditch' support before it goes into free fall, so believe it or not, this crazy move in precious metals could get crazier this week, signaled by the Philadelphia Gold and Silver Index (XAU) blowing right through significant resistance Friday, seen here. Thus, it will be interesting to see how precious metal shares trade today, because if Friday's melt up was just mostly month-end window dressing related buying, then this week could see some serious give back. And if there is to be some give back, with open interest put / call ratios still highly supportive of firm pricing, it should be seen this week because options expiry is approaching on the 20th, which will make a correction far more difficult to envision unless hedgers start bailing on their positions. Personally, I see the potential for additional gains, however I would be stupefied if the HUI didn't go back down and test the large round number at 200 before continuing higher. This is the strongest rally I have ever seen, and is in fact the strongest based on select measures since the 60's - yes the 60's - over 50-years ago. That's a long time - no? That means even if a large part of what's happening right now is because of crazed traders on both sides of the formula, still, what's happening is epic in scale, which in turn means - it's big. And it is big. The status quo is doing their damdest to screw you out of every penny you have, the weary are attempting to protect themselves, and then there's everybody else who are determined to remain on 'ignore' - or 'snore' - hoping they can go back to their wicked ways of over-consumption and materialism one day. So who's going to win in the end? Answer: Nobody. And you should not think in these terms. You should be thinking of protecting your wealth from the rabble via time tested and prudent methods - not making billion $'s so you can date Russian supermodels - which I understand is the number one goal amongst male hedge fund types - you know - the guys in control of all that money. The prices are starting to look right for the Federal Reserve to raise interest rates again. Markets aren’t. 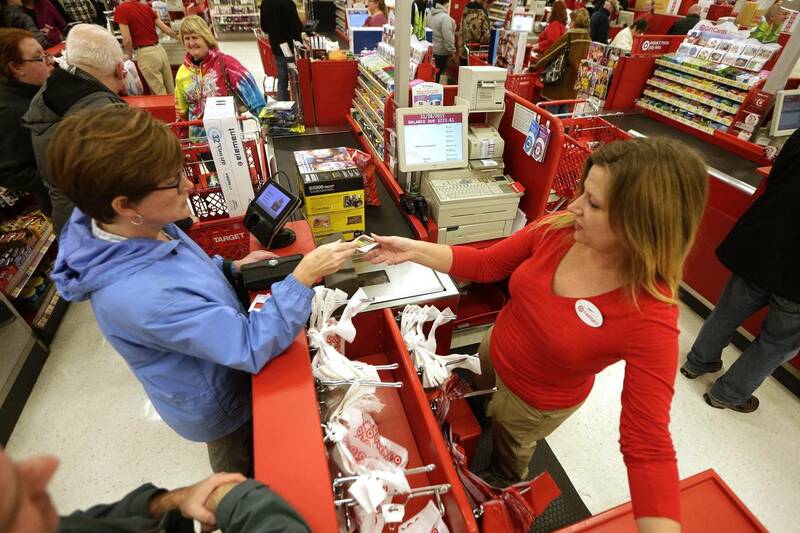 The Labor Department on Tuesday reported that consumer prices rose 0.4% in April from March, marking their sharpest monthly gain in over three years. The increase was driven by a rebound in gasoline prices—regular gasoline averaged $2.11 a gallon last month versus $1.97 a month earlier. But excluding energy, prices rose 0.2% on the month, after a flat reading in March. 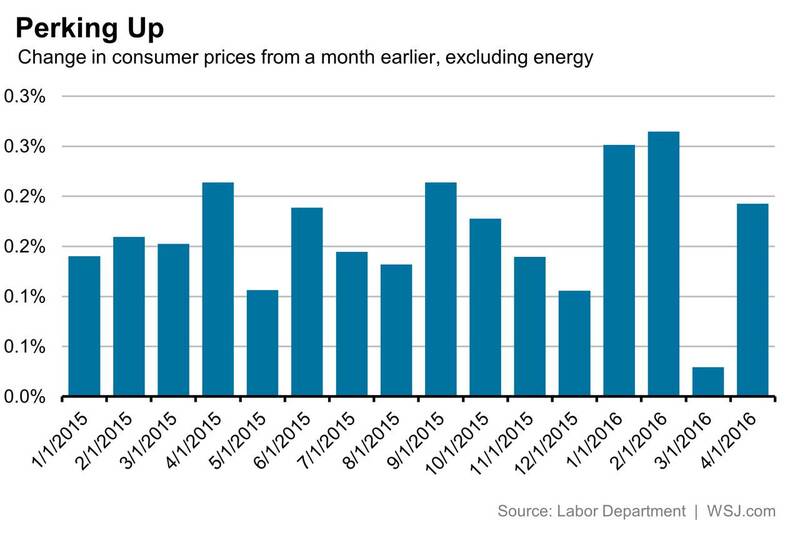 That is an indication that the impacts of not just lower energy prices, but of the dollar’s strength, are beginning to fade. With those drags on inflation easing, the tightening labor market should have a more pronounced effect on prices. Indeed, prices for services excluding energy, which are less exposed to the dollar (you can’t import haircuts), have been far stronger than goods prices, which are. That isn’t to say that inflation is about to roar ahead. Even with the unemployment rate at 5%, wage growth has only picked up slightly, with average hourly earnings in April up just 2.5% from a year ago. They will have to grow more quickly than that for the Fed to reach its 2% inflation target. Moreover, even if employers have to pay workers more, it isn’t clear how easily they would be able to pass those costs on to consumers. Rather, labor’s share of U.S. income, which has dropped sharply since 2000, might start to go up—a nice outcome for workers, though not for profit margins. Still, with prices looking firmer, the Fed’s expectation, as of March, that it would raise rates twice this year has hardly been derailed. That would especially be the case if monthly job gains bounce back after April’s slightly disappointing payrolls figure. A June rate increase would be a stretch. Still, a strong May jobs report along with upward revisions to previous months could make it happen. Adding to the case for an earlier move were April retail sales figures last week and industrial production figures on Tuesday that indicate the economy is reversing its winter weakness. If not June, then July certainly seems like it could be a go. Yet futures are now pricing in only about a 25% chance that the Fed raises rates by July, and only place about an 80% chance of the Fed moving at all this year. Investors may be just a few economic reports from a major reassessment of what is going to happen to rates.